The bad news first, such as it is: There are parts of the 2016 TV series of Kentarō Miura’s Berserk that make me grit my teeth in dismay. But they are not because of the adaptation itself — they’re things that Berserk always had, for better or worse, and they’re just thrown into all the sharper a relief by being animated. What is truly great about Berserk, though, is also all here: its psychological acuity, its breathless and headlong storytelling, and its unparalleled ability to conjure a sense of a world sliding into an abyss. And if the adaptation shows up the flaws all the more, it also casts light on a key aspect of this chapter of Miura’s story — how it’s less about Guts and his quest, and more about the physically and spiritually wounded who come to follow him. Some recap. 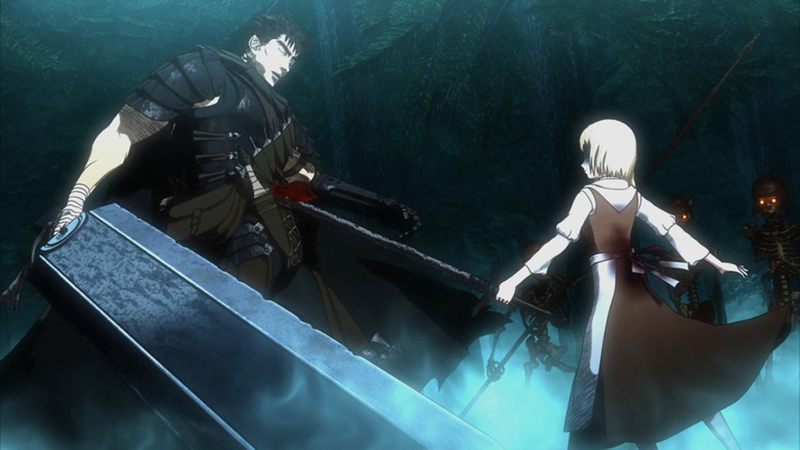 Miura’s original manga dealt with the adventures of Guts (possibly “Götz”, given the Germanic flavor of the setting), a lone sword-for-hire in a land reminiscent of Europe during the Thirty Years’ War. As part of the mercenary army, the Band of the Hawk, he became an unwitting superstar for his staggering feats of derring-do courtesy of a sword the size of a battleship. He finds himself drawn to both the charismatic and ambitious leader of the Hawks, Griffith, as well as one of his female officers, the indomitable Casca. 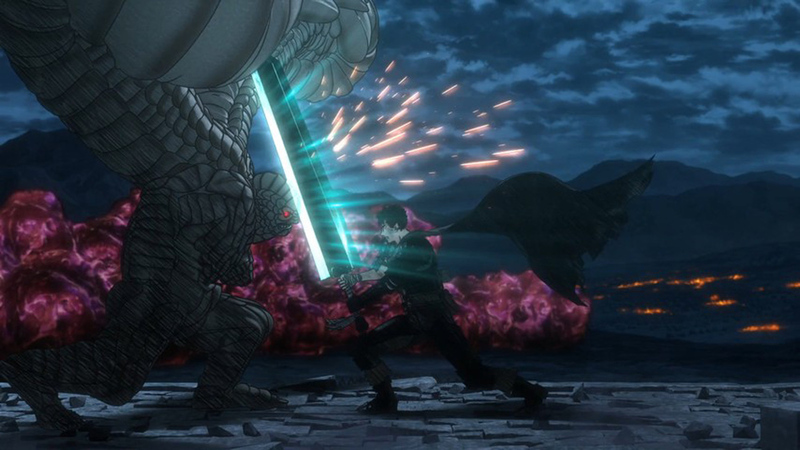 Guts becomes divided between his admiration for the former and his love for the latter. Then all is shattered when Griffith’s hunger for power invokes nothing short of a millennial apocalypse. Griffith is transformed into a diabolical demi-god; Guts loses an eye and an arm trying to save himself, Casca, and his comrades from being sacrifices to a demon horde; and Casca is left a shell of her former self after being violated at Griffith’s hands. All this was told in the first twelve or so volumes of the manga (still ongoing at volume 38), the first incarnation of the property as a TV series in 1997-8, and a cycle of three animated films released in the last couple of years. What’s brilliant about the way the new 2016 TV series of Berserk has been constructed is that it picks up where both the original TV series and the movies have left off. You can watch either one, or both, and then segue directly into the 2016 series without missing a beat. My preference was to re-watch the original series and then follow it up with the new one — both to remind myself of all the nuances the three-movie cycle left out, and to more directly compare and contrast the two shows. Doing so confirmed for me how the mere fact we’re getting the rest of this epic story finally told is indisputably exciting, even if that also re-confirmed for me how some of Miura’s storytelling choices for this chapter of his saga stick in the craw. 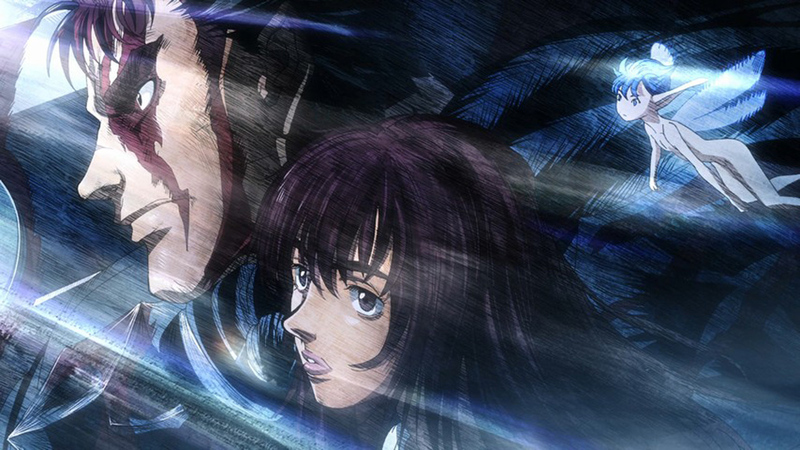 Berserk 2016 opens with Guts still on the run — from the demons that emerge at nighttime, and towards Griffith, wherever he may be. He acquires a hanger-on of sorts, a comic-relief sprite named Puck, although Guts has no faith that anything good will come of it. It’s not that he hates other people (if anything, he just hates showing that he cares); it’s that people who hang around him have a bad tendency to die in messy ways. Such is the case with a traveling monk and his daughter: Guts accepts a lift in their wagon, and they end up becoming demon fodder — with Guts putting his sword through the little girl after she’s made into a vessel for the dark forces that hunt him. Guts eventually crosses paths with the Holy Iron Chain Knights, soldiers in the service of the Holy See, a religious order that sees the best expression of faith in God to be by way of self-abnegation and mercilessness towards heretics. (Miura was always an antipietist in his work, but this chapter of Berserk really pounds it home.) 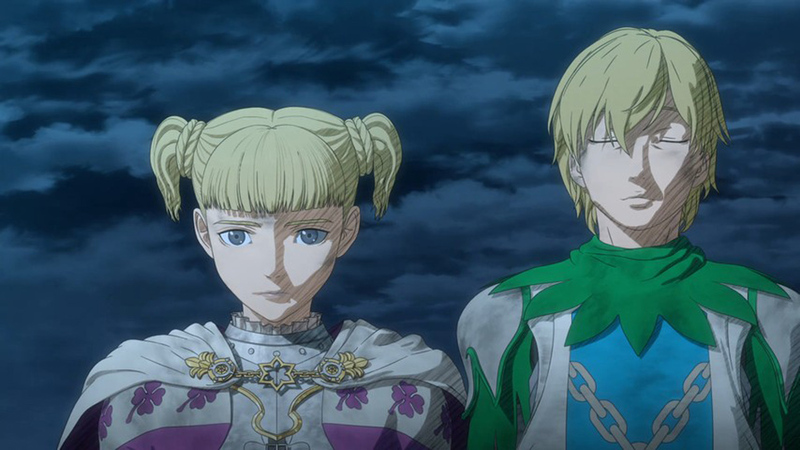 The Knights’s leader, Farnese de Vandimion, is in many ways an echo of Casca: she’s a woman in a line of work that is normally performed by men, and uses it as a way to overcome — or maybe compensate for — emotional damage she received when she was younger. In Farnese’s case, she’s still ruled by nameless and shapeless fears that have wracked her since childhood; when she scourges Guts for his participation in heresies, the vigor with which she flogs him is only matched by the pain she directs back at herself in private as well. Even more sadistic, but without any of Farnese’s redemptive self-doubt, is Mozgus, Chief Inquisitor of the Holy See. With his geometrically precise features and his massive stature, he resembles one of the blocky figures from De Es Schwertbeger‘s paintings. No greater glory can be raised up to God than to shed the blood of heretics in His name, and he does so with such zeal that even Farnese begins to feel rattled. It’s not just that these tortures disturb her, but that she isn’t sure why that should be the case. Among those being investigated, and potentially packed off to the torture chamber, is a cadre of pagans, among which is none other than the long-lost Casca. She’s come under the protection of a group of prostitutes who service refugees from battle in the region, and who have no idea who she is, what she’s been through, or why she is so insensate. 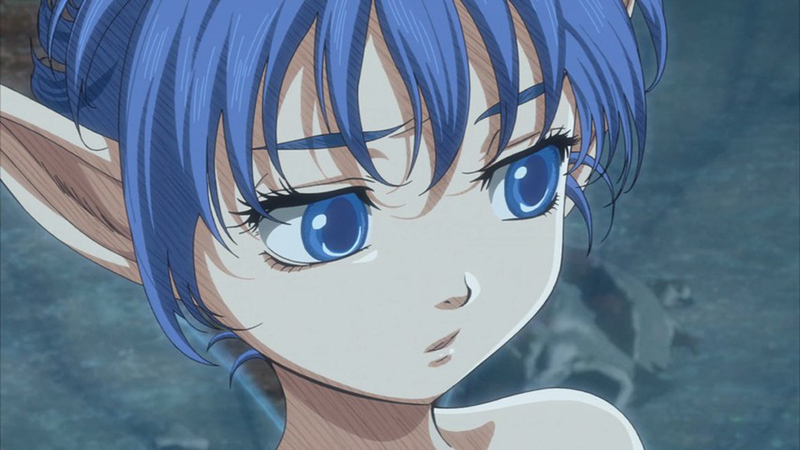 When the Knights discover Casca in the middle of a pagan ritual — where the participants quickly become demon fodder — they seize her and take her to be burned as a witch by Mozgus. 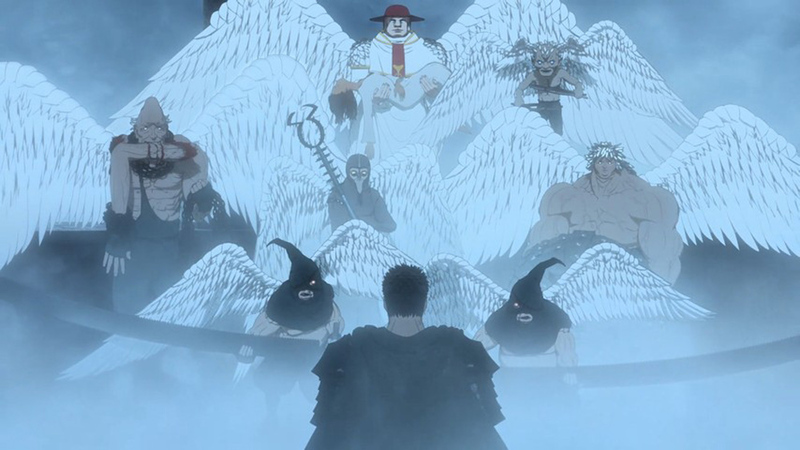 And so Guts and his few new hangers-on head to the tower stronghold where Mozgus holds court, but the danger he poses is way above and beyond merely being able to hold sway over hordes of believers. Across the arc of any story this massive, there inevitably come long periods where the main characters don’t change. At first that sounds like a bad thing, because one of the core principles of good story construction is change for your main character — she goes from somewhere to somewhere, both physically and spiritually. But that only matters in the longest of runs. There can come stretches of the story where the real action isn’t in the main character, but in the way he affects the lives of others. So it is with Guts in this part of the story. Anyone who’s followed along since the beginning knows what he is and why he is this way: he lives now only to protect Casca from further harm and to strike down Griffith and as many other members of the Godhand as he possibly can. He’s important in this part of the story not as a subject of analysis, but as an anchor or an axis, something the rest of the action can revolve around, and someone against whom others will play off. I worked my way backwards to such a line of thought by way of the first thing that popped out of my mouth when the credits rolled on the end of the last episode: “This is Farnese‘s story, not Guts’s.” It’s Farnese who has the most dramatic changes of heart over the course of the season, and it’s to the story’s credit that such a radical, deep-seated turnabout in her soul does not seem either contrived or motivated by story conveniences. Buddhism has a term for this kind of inner revolution, paravritti, and I thought of it often while watching Farnese during the story. From the beginning Farnese’s story is salted with hints that the reason she is this way is because she has clung to such a worldview as a psychic talisman, like the teddy bear she had a child. When her father took it from her and burned it to teach her a lesson, the lesson she learned was not so much how to draw on her own inner strength, but how to leverage outward violence as a way to simulate it. Fire is power, she has learned; to command such power herself as a child, she became a pyromaniac. 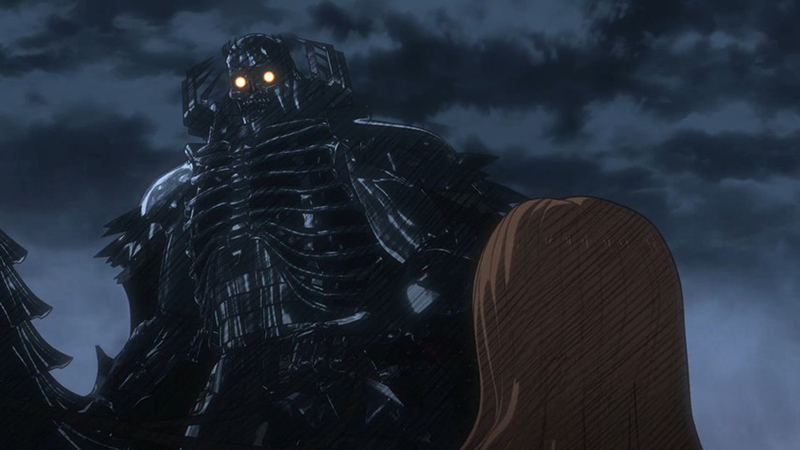 What sets Farnese free is not just the sight of Mozgus’s climactic transformation into a golem-like monster, or the feeling that such a thing is not a child of God but rather the Devil. Rather, it’s when she realizes she has been growing ever nearer to someone who is the antithesis, the antidote to all that — by way of how he lives, not just what he says. That person is Guts, and while she begins as first his enemy and his kidnap victim, she in time sees him less as an adversary and more as a model to emulate. In the last couple of episodes, when a diabolical force is overrunning the land and threatening to corner them in Mozgus’s stronghold, Guts is the only one who has anything like a plan, and anything like actual hope. It does more than just save all of them for real; it gives Farnese permission to stop clinging to a way of life that hasn’t served her. Now we come to the bad news. The first thing I want to get out of the way is some discussion of the animation style, about which a good deal has already been said and written, most of it negative. I get it, believe me. Back in 1997, the only way to create something on the scale of Berserk on a TV budget was, essentially, to cheat — limit the animation, simplify the designs, pan the camera across Osamu Dezaki freeze-frames. But it worked, because it allowed the focus to move away from reproducing Miura’s fetishistically detailed artwork and towards the story — and it was always the story, and Miura’s tremendous sense of motivation and character, that drove this project. I suspect there was no way they could get away with a 1997 look in 2016 (good god, has it really been almost twenty years? ), and so the current CGI-heavy look of the show was a matter of expectations. The parts of it that work best are individual aspects of the new look — the way the CGI reproduces the hand-drawn shading of figures, for instance. But the movements of faces, mouths, bodies, all still look uncomfortably marionette-like. What makes this stand out even more starkly is how at times the show drops completely back to a hand-drawn look — e.g., for flashbacks, or for material involving bystanders or tertiary characters. My guess was that there was some aesthetic justification for it, maybe as a way to set the main characters all the more apart from the backgrounders. But all it does is make the present-time, front-and-center material look all the more … well, manufactured. It’s not that I hate CGI and want it erased from the face of the earth; it’s a tool that can be used well or badly. It’s just that it feels like it doesn’t fit this story — it seems simultaneously too precise and too clunky, way unsuited to material that should be prettified as little as possible. And then there’s Casca, whose treatment in this part of the story bothered me since it first showed up in the original manga. To use a term that originated in discussion of Western comics, she’s been “fridged”. Rather than being killed off as a way to motivate the main (typically male) character’s anger, she’s been turned into what amounts to a showroom dummy, always pop-eyed and drop-jawed, expressing only fear or dull surprise. Miura drops some major hints in future volumes of the manga that the “real” Casca is Still Somewhere In There, and just needs the right key to bring her out, but none of that is provided here. In fact, I suspect dropping such a hint all the earlier in this story might well have made things worse by teasing and not following through. If nothing else, it’s at least consistent with Miura’s design that the main characters change as little as possible in this chapter. But sometimes consistency is not the highest of virtues. Art is flawed, and I say that not as a condemnation but as a description. You cannot put a work of art in front of an audience and not expect someone, anyone, to make a good case against some part of it. Sometimes the flaws are foundational, and there’s dispute even there: arguments have been made for why something as putatively disposable as Tommy Wiseau’s The Room is cap-A Art. What matters for any particular audience, I guess, is whether they can forgive the flaws — or better yet, appreciate the context in which they arise — and see through them to the heart of the story. I may always wince at the way Berserk 2016 handles Casca and I may always wrinkle my nose at the animation, but the whole of Miura’s vision has always been what mattered. And now, at long last, we’re getting that much more of it. The warts were always going to be included. This article was originally published on Ganriki. Thanks to our friends at Ganriki for letting us share this content. Ganriki is a partner in Crossroads Alpha along with Psycho Drive-In. Serdar Yegulalp (@genjipress) (G+) is Editor-in-Chief of Ganriki.org. 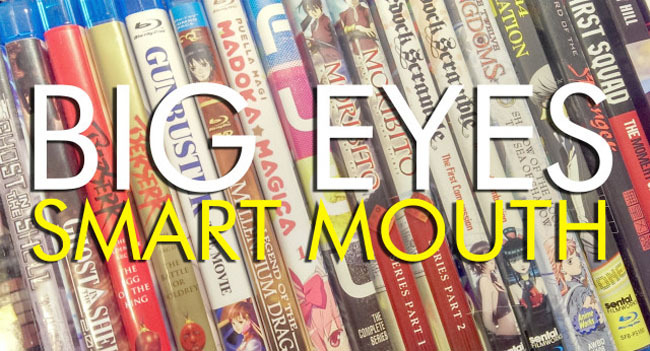 He has written about anime professionally as the Anime Guide for Anime.About.com, and as a contributor to Advanced Media Network, but has also been exploring the subject on his own since 1998.